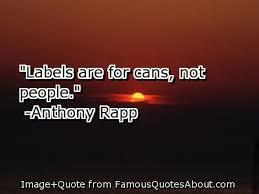 Covenant Relationships: Labels Are For Cans Not People. I love the way the new Coca-Cola advert dealt with the issue. Six men from different walks of life were brought together in a dark room to share bits about their lives and they couldn’t believe their eyes when the lights were turned on. Were it not for the dark room, they might have misjudged each person’s personality based on outward appearance. I attended a conservative church once and I remember that any member that was not conformed to certain type of dressing was alienated . There are times we pass mean comments about effeminate males, tattooed people, calling them names without even knowing or understanding their backgrounds or who they really are. Nobody deserves to be labelled. Stop with the judging. The fact that someone's image doesn't fit the one you have in your head doesn't make such person a bad person or less human. Love and Let Love Lead You. There is so much we can do and change with a life of love.